With the modern combat handgun in mind, Silencerco set out to create a silencer that performs well and looks like it belongs, the best possible marriage between host weapon and silencer. Silencerco went to work to make a suppressor that maximizes sound suppression levels, allows the use of more host pistols with factory sights, and has more operationally friendly features. 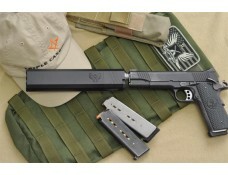 What was created was the Osprey pistol silencer available for 9mm, .40 S&W, and 45ACP.